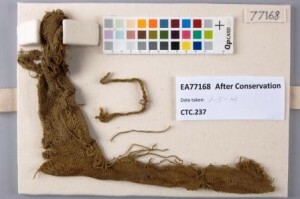 by Geraldine Sim and Gennifer Majors As the last project before our work placement, those of us in our first year at the CTC undertook an exciting new adventure in our studies: a collaborative project with the British Museum to conserve ancient archaeological textiles. These pieces had been buried for over a thousand years in 7-9th century AD Christian graves at a site on the island of Kulubnarti, Sudan. Excavations were carried out there and on the neighbouring western bank of the Nile by the University of Kentucky, under the direction of Professor W.Y. Adams in 1969 and 1979. 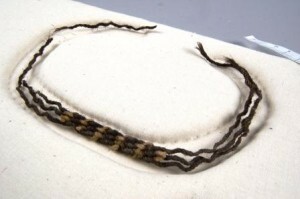 The objects entered the collection of the British Museum in 2005. 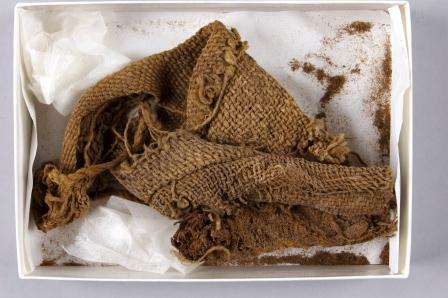 The project was initiated by Julie Anderson, Assistant Keeper (Curator), in the Department of Ancient Egypt and the Sudan, and was jointly developed by Julie, Anna Harrison, Senior Conservator, British Museum and Sarah Foskett Conservation Tutor, Centre for Textile Conservation and Technical Art History (CTCAH), University of Glasgow. It was a great opportunity to work in conjunction with the British Museum and proved to be a wonderful experience. 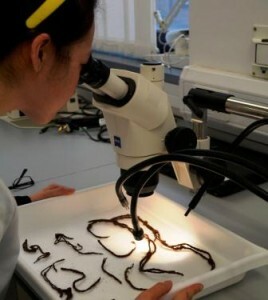 The aim of the conservation treatment was to prepare the textile fragments for storage and to make them accessible for study purposes. The fragments were made of a variety of materials, in a range of construction styles, shapes, and conditions. Each of us was assigned a fragment of woven cloth that had been wrapped around a buried body, and a fragment of cord that had been used as a shroud binding. 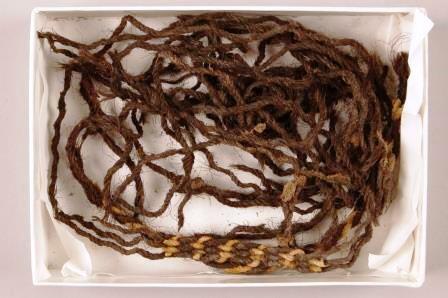 The fragments were generally wool or cotton, but many of the cords contained yarns of dark human hair, a material that was very new to us. Prior to meeting with Anna Harrison, we were given a number of documents detailing the project’s objectives and standard of work. Due to the nature of the objects, they yielded little information in their ‘before treatment’ condition. It was not until some level of intervention had been undertaken that many of the fragments would reveal more information. Treatment also had to be documented thoroughly while taking an active approach in responding to the needs of the individual objects. It felt quite intimidating until our individual consultation with Anna, where we were able to discuss our treatment proposals. It was also good to know that Anna was available for further consultation through our tutor, Sarah, as treatment progressed. There were many challenges we encountered during our work. The presence of human hair and human remains from burial meant that, before we could devise a treatment plan, we had to learn the methods and legality behind handling human remains from the museum. We also had to focus on a detailed analysis and investigation of the fragments materials and techniques and ensure that our documentation was formatted in a style that could be readily transferred to the British Museum collections management system, including the Collection Online Database. Our treatments had to retain as much evidence of the object’s history as possible, and so our methods required minimal interventions. As a result, the fragments remained incredibly delicate, soiled, and uniquely shaped after treatment and required custom-made protective supports. Beyond the treatment of the fragments, manufacture of these supports also proved to be a challenge. Materials used, techniques applied and standard of finish in constructing a support mount had to conform to the British Museum’s standards. In approaching this, we had a lot of support from our tutors. Sarah was there to provide feedback in choosing and constructing appropriate padded boards for our individual objects, and Karen Thompson (Conservation Teacher, CTCAH) was our ‘go-to person’ in aligning the weave of the cotton calico and in obtaining enough tension for the boards. Overall this project has been enlightening, challenging and thought-provoking. It was wonderful to have the opportunity to work with such historically significant pieces. Their age and condition meant that they were quite unlike anything we had experienced previously and they therefore demanded a completely different approach. 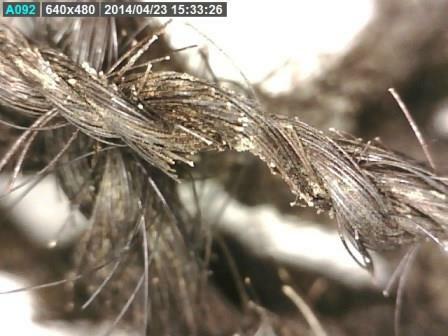 This expanded both our technical knowledge of fibre degradation through object study and our practical ability through conservation treatment.